Kartik Wahi, Claro Energy Director. 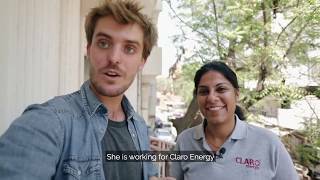 Working to offer an alternative to polluting and expensive diesel gensets that currently dominate rural Indian agriculture, Claro Energy has either deployed or is managing around 6,500 solar pumping systems in about 15 states, and expects to increase that to as many as 15,000 by March next year, according to Claro director Kartik Wahi. Wahi believes that Claro and its handful of competitors could deploy as many as 100,000 systems in the next year, and no less than 70,000. "Everyone is realizing that solar pumps make sense for both the end-user as well as state governments," Wahi told Power for All, noting that last-mile connectivity is a huge capital expenditure that state governments and utilities are happy to get off their books. Operator contracts with Indian states mandate post-sales service for 5 years. And while Wahi recognized that government subsidies can be inefficient and sometimes warp the market, they are also "drivers of adoption and give us the opportunity to hit critical mass, and eventually go mainstream on a purely commercial basis"
Claro sees huge opportunities for growth, including those beyond India and solar water pumping, as does a recent Bloomberg New Energy Finance report, which estimated a total capital expenditure of $60 billion required to replace the 20 million currently installed power and diesel irrigation pumps in India with solar. The report also said that annual consumption of diesel by 8 million diesel pumps in India each year was worth $11 billion, noting that the current installations of solar irrigation pumps in the country as of the end of FY2016 was only 43,098. The India-led International Solar Alliance (ISA), meanwhile, has set aside a $2 billion line of credit to promote decentralized renewables in Africa, a portion of which will be used to deploy 100,000 water pumps. Since India has tied that money to a local content requirement, Wahi believes there could be interesting opportunities for Claro to supply equipment to other USAID grantees already active in Africa, thereby opening up access to the ISA debt financing. "The opportunity hasn't taken off yet, and we want to explore the opportunities in Africa", he said. Claro is also looking at the mini-grid space to determine whether solar pumps can serve as an anchor tenant in rural communities, similar to the model being used by the Smart Power India program that (to date) has focused on telecom towers. The company is piloting such a system to determine feasibility. "In the future there will be a lot of overlap between solar pumps and mini-grids", he said. One key to future growth, Wahi concluded, is international agreement on low voltage DC (LVDC) applications, which are currently under development by the International Electrotechnical Commission (IEC). Establishing uniform standards will be key to sustainable market growth.